From a small village in northern India, Jatin Walia travelled to New Zealand at the age of 18. He enrolled at Auckland’s NorthTec Tertiary Education Institute for a degree in Applied Management. In 2016, Jatin graduated from the institute, but continued to work several jobs during his time in Auckland. While his education concluded in 2016, Jatin’s rendezvous with New Zealand was far from over. New Zealand’s safe and welcoming environment had persuaded Jatin to apply for a residency permit in Auckland. However, the government of New Zealand announced a modification in its immigration rules, the same year he graduated. The government decided to add higher remuneration thresholds as an additional means of defining skilled employment. Back in 2013, New Zealand had modified its laws on English Language requirements for international admission. As a result, there was a substantial rise in the numbers of enrolments at institutions of higher education in New Zealand. In the 2016 revision, the government of New Zealand had increased the number of points required for selection under the skilled migrant category from 140 to 160 points. It was then, that Jatin decided to become an entrepreneur to secure a residence permit in the country. He said the changes to the skills category prompted him to “think outside the square”. 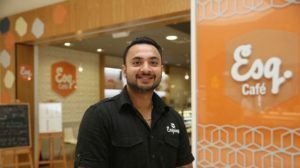 Within a few days of the revision, Jatin bought an Esquires café franchise in New Zealand with the money that his family had raised in India and employed six full-time and three part-time employees. Jatin also wants to bring his wife and other family members to New Zealand, once his business picks up the pace and he receives his residency permit. New Zealand’s quality education at affordable costs is seen as a major attraction by many aspiring students, across the world. With the added advantages of diversity and safety, New Zealand is proving a smart choice for many to study and live.